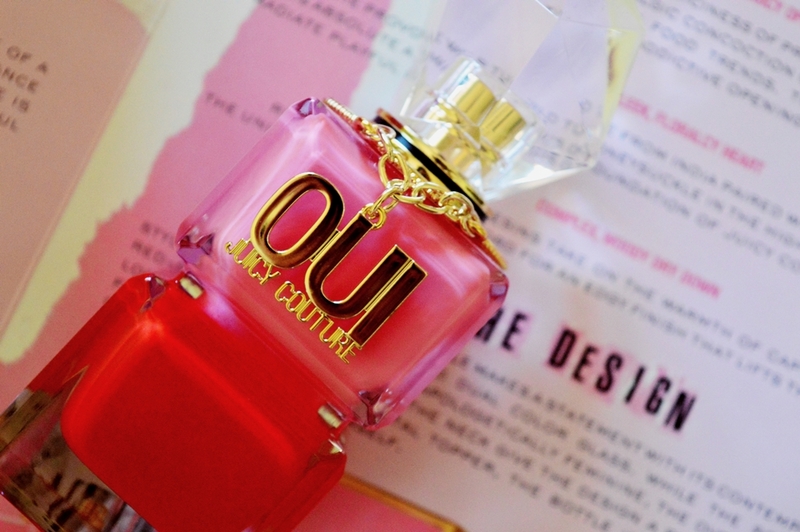 Juicy Couture is the fragrance range with THE most views on my blog – so I am sooo excited to bring you a review on OUI today! I super slacked on getting this review up. Sorry guys! This sensational (scent-sational) fragrance has been available since September and I have had nothing but queries on this new Juicy Couture addition since then. 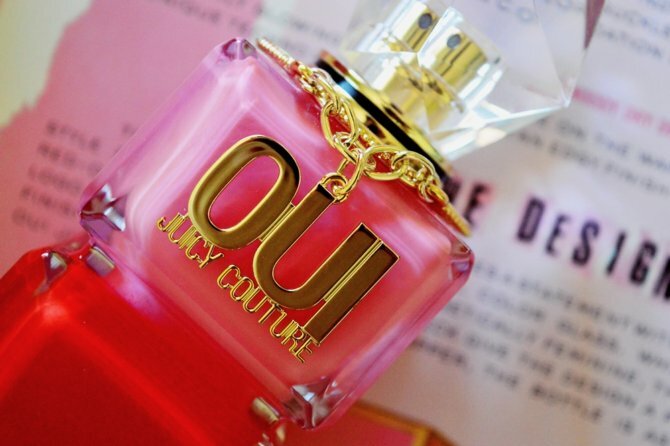 More than anything, JC are known for their bottle design and Oui takes the cake by bringing in new elements whilst keeping to the much-loved theme of Juicy Couture. The two toned bottle is a brand new, never-before-seen addition to the collection but the facet-cut crystal lid is well known. The box mimics the bottle with the gold logo embossing sitting on top of the bubblegum pink and morange shades. Before even smelling the fragrance I was excited as I saw watermelon listed as an opening note. You NEVER see watermelon in fragrance! This immediately introduces you to a sweet juiciness. There is also another sweet infusion: fresh pear. The overall effect of Oui is one of uniqueness and freshness. HAPPINESS. This theme is always underlying across the fragrance range, with the inspiration of each being different. 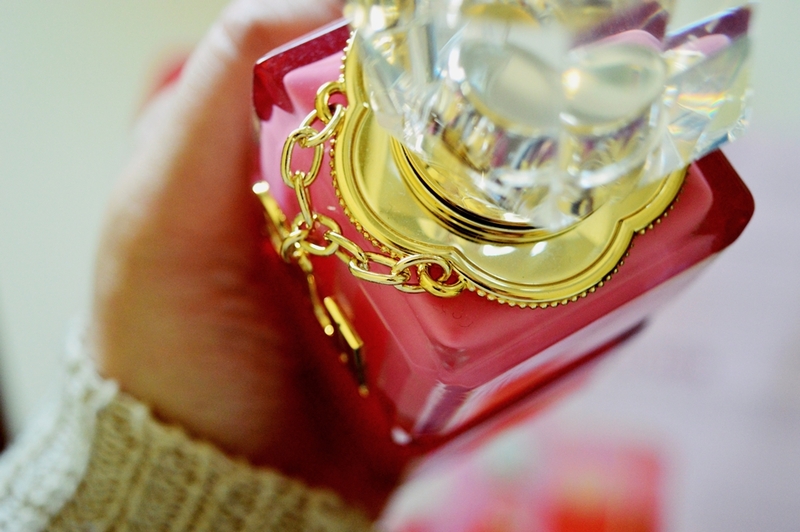 Oui is inspired by the new generation of Juicy Couture consumers; modern women going on a journey of self discovery. I find Oui also lasts longer than the previous few launches this year. They always have a great staying power but Oui can definitely last the entire day and more. I generally spritz three sprays, wait a moment for it to dry, and spritz three more. 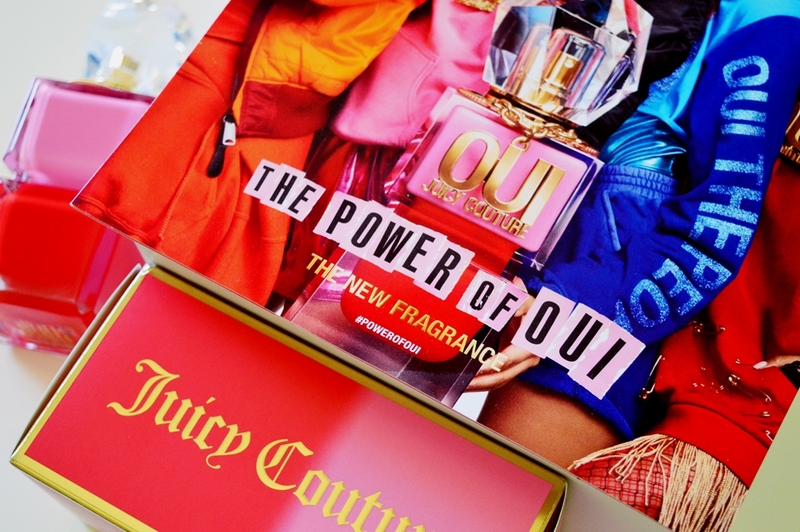 Juicy Couture’s Oui is available now from selected department stores. If you purchase a 100ml bottle you will receive a free Juicy Couture tote bag. Perfection for summer on the beach! I didn’t think I’d like this fragrance, but I am quite obsessed with it. It’s so nice….fruity, but not sickly sweet…in my opinion. I love the 2nd last picture in this post…. such a unique angle. Honestly….only a blogger would compliment the angle of a picture. LMAO. Who am I???? ?